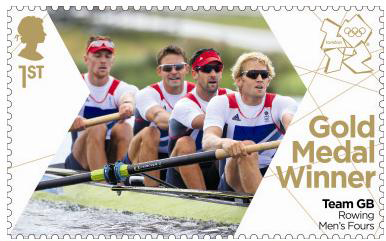 shipstamps.co.uk • View topic - Coxless Four Rowing Boat. A coxless four is a rowing boat used in the sport of competitive rowing. It is designed for four persons who propel the boat with sweep oars. The crew consists of four rowers, each having one oar. There are two rowers on the stroke side (rower's right hand side) and two on the bow side (rower's lefthand side). There is no cox, but the rudder is controlled by one of the crew, normally with the rudder cable attached to the toe of one of their shoes which can pivot about the ball of the foot, moving the cable left or right. The steersman may row at bow, who has the best vision when looking over their shoulder, or on straighter courses stroke may steer, since they can point the stern of the boat at some landmark at the start of the course. The equivalent boat when it is steered by a cox is referred to as a "coxed four". Racing boats (often called "shells") are long, narrow, and broadly semi-circular in cross-section in order to reduce drag to a minimum. Originally made from wood, shells are now almost always made from a composite material (usually carbon-fibre reinforced plastic) for strength and weight advantages. Fours have a fin towards the rear, to help prevent roll and yaw and to help the rudder. The riggers are staggered alternately along the boat so that the forces apply asymmetrically to each side of the boat. If the boat is sculled by rowers each with two oars the combination is referred to as a quad scull. In a quad scull the riggers apply forces symmetrically. A sweep oared boat has to be stiffer to handle the unmatched forces, and so requires more bracing, which means it has to be heavier than an equivalent sculling boat. However most rowing clubs cannot afford to have a dedicated large hull with four seats which might be rarely used and instead generally opt for versatility in their fleet by using stronger shells which can be rigged for either as fours or quads. "Coxless four" is one of the classes recognized by the International Rowing Federation and is an event at the Olympic Games. In 1868, Walter Bradford Woodgate rowing a Brasenose coxed four arranged for his coxswain to jump overboard at the start of the Stewards' Challenge Cup at Henley Royal Regatta to lighten the boat. The unwanted cox narrowly escaped strangulation by the water lilies, but Woodgate and his home-made steering device triumphed by 100 yards and were promptly disqualified. This led to the adoption of Henley Regatta rules specifically prohibiting such conduct and a special prize for four-oared crews without coxswains was offered at the regatta in 1869. However in 1873 the Stewards cup was changed to a coxless four event.